Finally, my phone line is actually ‘maxed out’. I’m hitting the 6dB target SNR now, which has never happened on my line before. Sadly it means I am 0.08Mbps off the 100Mbps sync speed! 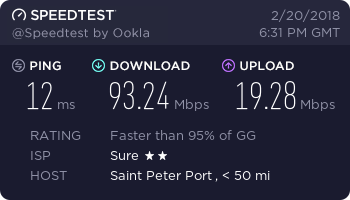 The speed test results are actually very impressive. When I was on the 60Mbps service I would usually only get 45-50Mbps on average, so I was sort of expecting the 100Mbps service to scale similarly i.e. a throughput nearer 80Mbps. The price of the new service is fairly high – £50.99 per month, or £62.98 per month if you bundle it with a phone line. 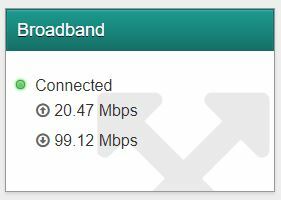 Compared to Gigaclear in the UK, which offers 100/100 FTTH for ~£47, Sure’s service is effectively 30% more expensive, and Gigaclear’s pricing includes VAT! I am genuinely pleased though that Sure are at least offering this product on the island. At least users now have the opportunity to choose from 4 different product offerings, priced at different levels. It will be interesting to see what the medium to long term plans are for Sure. In the UK, BT are beginning their roll-out of G.Fast, whilst in Jersey they will have island-wide FTTH (though, I might add, with fairly draconian usage limits). But in the short term, I’d really like to see some movement on IPv6! Guernsey – 60Mbps VDSL coming soon!